Vacationing as a family is one of the best ways to bond with your kids and create truly unforgettable memories. So when you feel like you’re ready to let your little ones dip their toes into the huge continent that is Africa, Morocco is the perfect destination. But, finding family friendly hotels when you travel to Marrakech isn’t always easy. Many of the cities riads are adult only or only accept children 12 and above. While there are many hotels as well it can seem like you’re missing out having come all the way to Morocco and then walking into a hotel that could be anywhere in the world. But there are pros and cons to all types of accommodation. Here are four things to keep in mind when you’re choosing where to stay with kids in Marrakech. What age are your children? Younger children may not do as well in a riad setting. There is limited room to play and most areas are not child-proof. Riads are meant to be an area to relax for all guests and in many ways are laid out more like a house than a hotel. You’ll be sharing that space with everyone else who is staying. What time of year is it? In the middle of summer you will want an air conditioner. In the middle of winter you’ll want heating. This is true especially if you have children. Check into what is available when you are looking at places to stay. Very few places in Morocco have central heat. In many riads portable heating units (electric or gas) are used. This may not be ideal if you have young children. What amenities do you need/want? Some riads are available to rent the entire space through services like Airbnb (grab a discount on your first booking if you choose this option with this link – AirBnB in Marrakech) this would give you access to a kitchen and several rooms to spread out and relax. If you don’t want to deal with food an all-inclusive hotel might be a great fit. 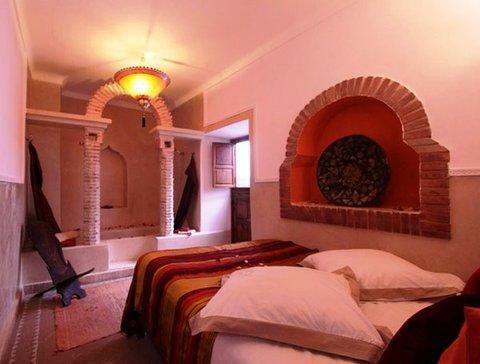 If you want a bed and breakfast type space a riad might work great. There are even hostels to consider! Where do you want to stay? Most riads are in the medina, the older part of the city. There’s no room to play outside of the riad and playing inside might be frowned on. But you’re in the middle of the action. Hotels and villas tend to be outside of the city and offer a lot more space but you have to factor in transportation to the city if you want to go. If you’re planning a family trip to Marrakech, here are a few suggestions of family-friendly places to help get you started. Before booking make sure to double check with the property about the age of your children. You know what they say: when in Rome, do as the Romans do. So if that’s your travel style, then Riad Zehar is as authentically Moroccan as it gets. 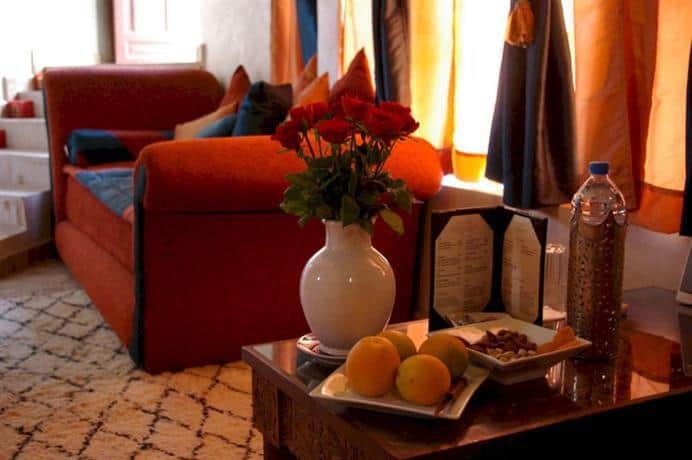 Located in a former 18th century mansion, the Riad has everything you need to live and breathe Moroccan culture. Taste some delicious traditional Moroccan dishes in the riad’s restaurant or learn to make your own with a cooking class. Located right in the heart of the Marrakech medina, Riad Reves D’Orient somehow manages to be an oasis of tranquility away from the hectic city life. That’s probably because it offers some of the best spa treatments in the city and features a jacuzzi on its rooftop terrace (which, has some gorgeous panoramic views of the city too). For families, the best part of it all is that the lux riad has just about everything you need from large connecting suites to fun activities and even a round-the-clock service at the front desk. When traveling as a family, it’s important to make everything as simple and easy as possible. At Riad Zolah, that’s exactly what families can expect. 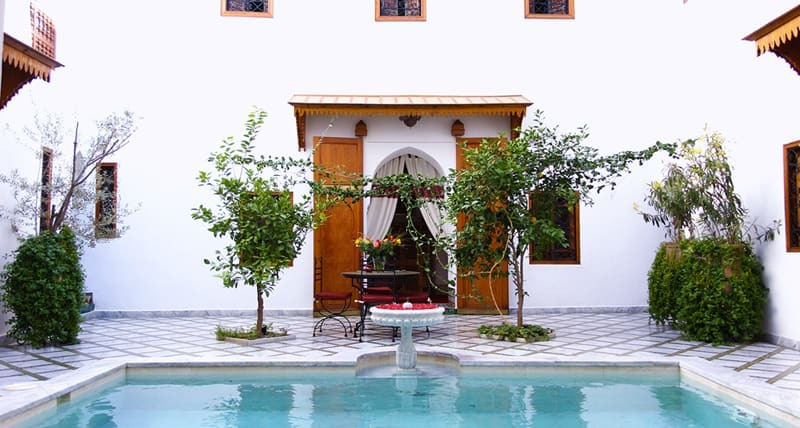 Located inside the Marrakech medina, this riad is perfect for families who want to explore the city on foot. 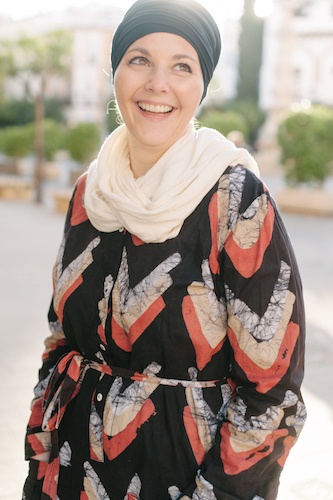 But if you want someone to do the planning for you, the staff at Riad Zolah can organize fun activities (like golf, cooking classes or hot air ballooning), day trips to places like the High Atlas or even excursions to the Sahara Desert. Just outside the old part of the city, Kenzi Club Agdal is an all-inclusive option for vacationing families. 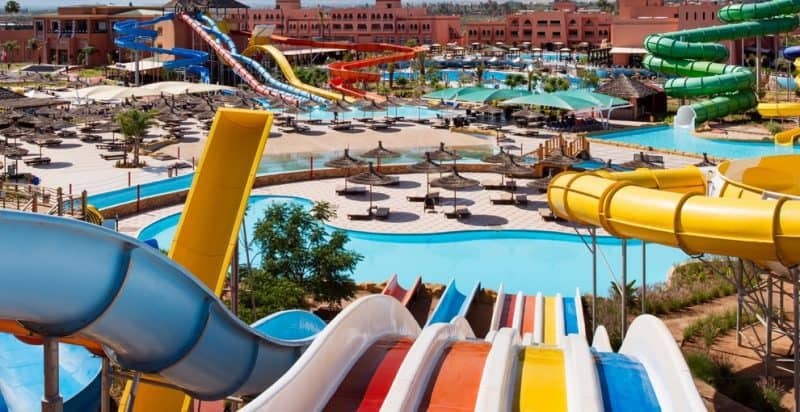 It offers heated swimming pools so the kids can swim any time you visit, waterslides and is all-inclusive so you don’t have to worry about finding something they’ll eat – chances are the hotel will have it covered. A bowling alley, tennis courts, soccer/football pitches, and kids clubs for all ages are also available. When you want to visit the city it’s just a short ride away. Nestled in a quiet neighborhood near the Majorelle Gardens, Riad Laila is perfect for families looking for a quiet getaway in Marrakech. 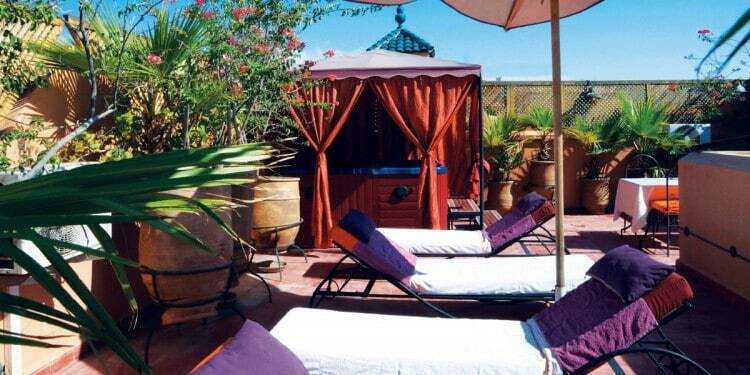 Plus, the riad’s outdoor swimming pool and rooftop terrace will really come in handy on those hot summer days. 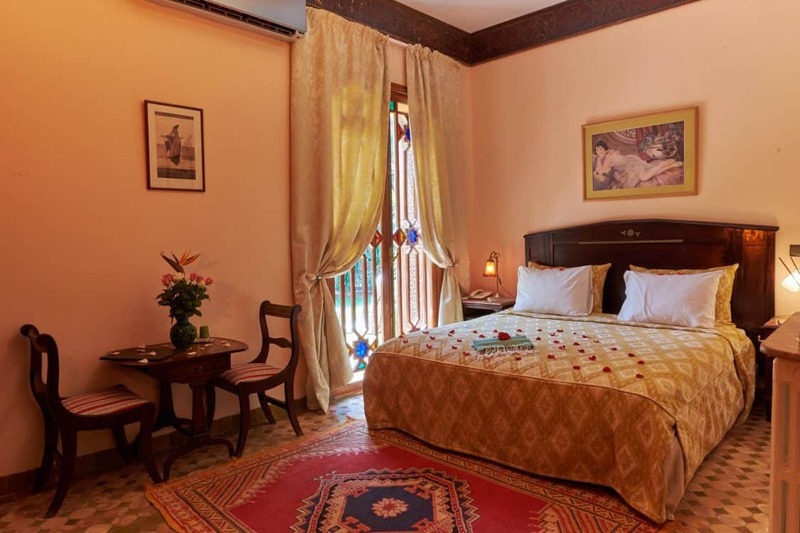 This riad is not in the central medina making it a good choice for families who would rather to have a bit of distance from the hustle and bustle. This hotel isn’t located in the medina but is a great option for families with kids – especially if visiting during warmer months. The hotel provides shuttles to the city center throughout the day so you can have the best of both worlds. There is an on-site waterpark and swimming pools. The food is all inclusive and there is entertainment throughout the day. 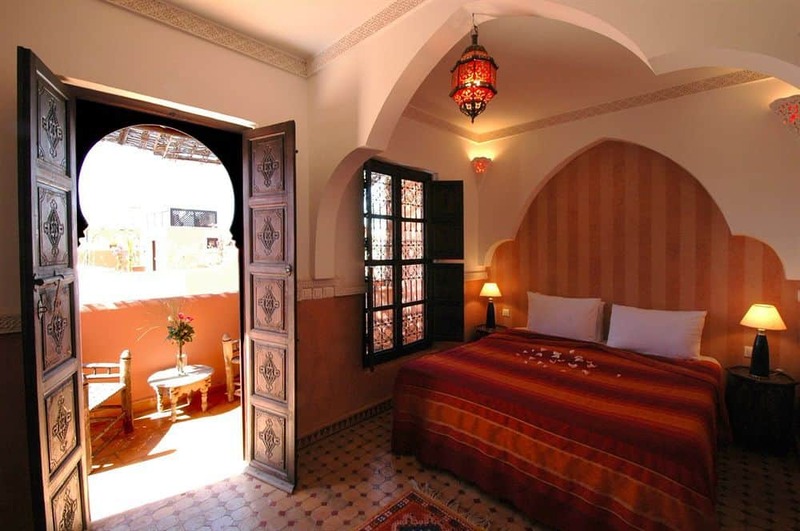 Located in the heart of the medina, Riad Zineb is perfect for families that want to be in the middle of the action. You’ll reach Djemaa el Fna Square in a few short minutes and from there you’ll have easy access to Marrakech’s museums, monuments and souks. If you want to get out of town, set up a day trip or longer guided tour of the Atlas Mountains, Morocco’s Atlantic Coast and the Sahara dunes. 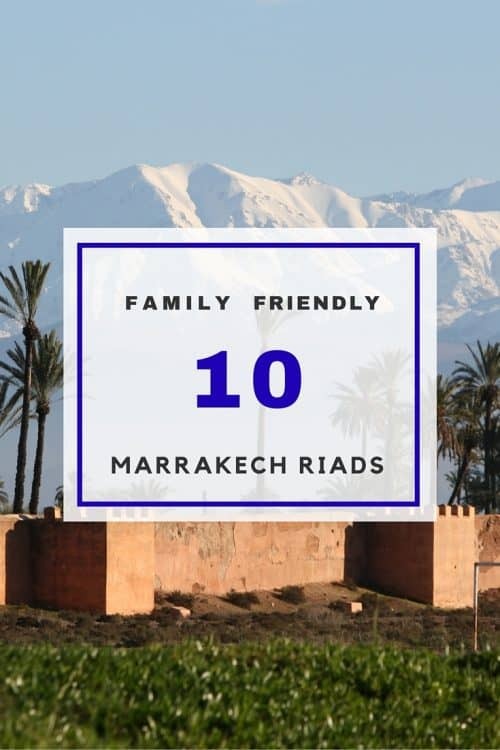 Not many hotels or riads pride themselves on being family friendly but Riad Africa does! They have a variety of rooms (triples/quads/connecting rooms and suites) that will suite any and all family configurations. They also have a large pool so that kids can enjoy swimming right on site. Don’t worry about packing extras they have baby cots, highchairs and car seats available to use as well. Families looking for a little luxury and a lot of privacy will love the suites at Dar Aynywen Villa. Located in lush gardens in Marrakech’s Palm Grove, the villa features 5 private air-conditioned suites beautifully decorated in traditional Moroccan style. It also offers a number of handy services like an airport pickup and a free shuttle bus to the city center. Make note, this hotel is not in central Marrakech, budget 20-30 minute to arrive in the center. “Itrane” literally translates to “Star” from the Berber language, and that’s exactly what this riad will make you feel like. With rooms offering stunning views of the Atlas Mountains, a swimming pool, several sun terraces with sun beds and even a massage room and hammam available onsite, there’s nothing you’ll need in Marrakech that you won’t find at Riad Itrane. Staying in other cities? Check out these guides with information on family friendly places to stay in Fez, Tangier, and Essaouira!